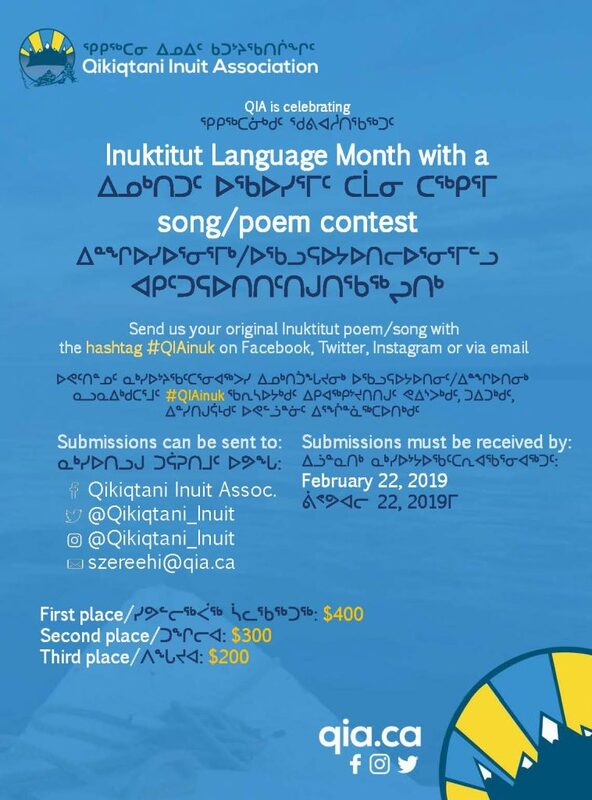 Iqaluit, Nunavut – January 31, 2019 – Qikiqtani Inuit Association (QIA) is proud to celebrate our third annual Inuktitut Language Month with a variety of events and initiatives. QIA is celebrating Inuktitut Language Month with a number of family-friendly activities and events. The event is hosted in partnership with Inhabit Media and features a book signing with authors of Inuktitut books. Each day in February QIA will introduce a different Inuktitut book published by Inhabit Media with the help of QIA funds on our social media sites (Facebook, Twitter, Instagram). In addition, we will also share free digital download links for each book. Participants are asked to share an original short song or poem (50 words or less) with QIA on social media (Facebook, Twitter, Instagram) using the hashtag #QIAinuk. First place winner receives $400, second place receives $300, and third place $200.